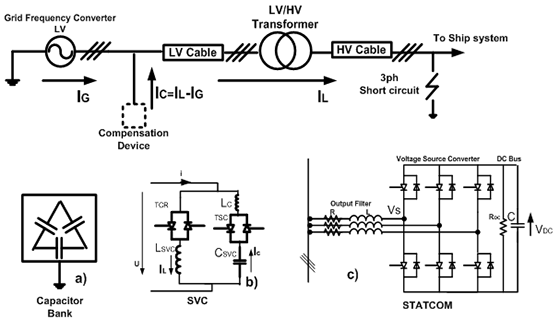 In the High Voltage Shore Connection (HVSC) standards, requirements are specified concerning shore connection grid voltage quality and protection selectivity between the shore connection grid and the ship power system. The required selectivity is that the shore connection substation shall be able to trip the largest on-board load protection device. From the selectivity perspective, it can go further and ensure the total selectivity of the entire ship system. The substitution of the ship’s generators by the shore system brings into focus an important aspect: the behavior of the shore grid with a power electronic system is different than that of the classical synchronous generators during short-circuits. This aspect becomes more restrictive if the shore system stays connected to the onboard network during disturbances. The maximum fault current delivered by the shore system is lower than the minimum fault current of the ship’s principal relay. A basic solution to increase the short-circuit current would be to oversize the Shore Connection installation. At the PowerTech Conference in 2013, it was proposed a paper which presents other feasible solutions to increase the short-circuit current. The aim of this work is to determine the most economical and technically viable implementation. The simplest solutions were explored first and then the more complex ones were studied: capacitor switched, using fixed or commanded capacitors, SVC and STATCOM. The Shore system was modeled in Matlab Simulink and it was tested in a short-circuit fault. The compensation solutions were designed in order to fulfill the system’s requirements. Investigating these solutions gives us a set of objective arguments to eliminate certain proposals, like the capacity bank or the SVC. On the other hand, this study identifies useful, practical methods for increasing the short-circuit current in an electrical system using the STATCOM device. Other solutions are being investigated and will be tested in the same way: additional generator, voltage source inverter coupled with batteries and other options depending on electric architecture changes. To know more about this study, you can download the full conference paper here. A standard shore connection now for low voltage vessels Shore connection : how to make a ship ready? California US: the platform of shore power development All Motors Contribute to the Main Busbar Short-Circuit, Reality or Dream?